The treatments on offer are designed for you comfort. This is a therapeutic massage either deep tissue or a more soothing relaxing touch. For you if you love to feel good!! Those who want professional friendly therapist and service. You will be asked to undress to your comfort level and as many or as few towels are used for your comfort. The most important thing is you feel relaxed and your and comfort and modesty accommodated. What is the aim of hotel massage? The aim of the treatments are to help you relax improve your energy and overall sense of wellbeing. 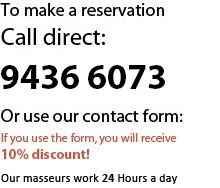 To provide you the opportunity to take a massage if your hotel has no facility or availability. Massage benefits on your body, organs systems, your physiology, your mind and general wellbeing, click here to find out more.